Quality natural skincare in stylish packaging. Hunter Lab is as aesthetically appealing as it is effective. Made in Melbourne, Hunter Lab’s formulas aim to combine the very best of mother nature with green science and outstanding craftsmanship to create high-quality natural skin and hair care. Designed to complement a busy lifestyle, Hunter Lab’s skincare remedies work to not only address your unique skincare needs but add modern design, gorgeous texture and simplicity into your daily life. Delivered through these gorgeously crafted formulas, skin receives essential vitamins, minerals and antioxidants to ensure your body stays healthy. Within the Hunter Lab range, you will find products that care for the face, hands, hair and body. 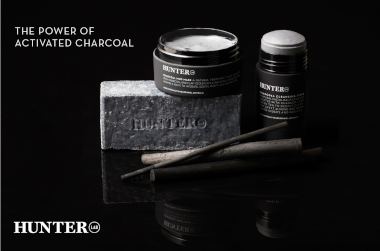 One of the most popular products within the range is the Hunter Lab Facial Fuel. This natural facial moisturiser works to nourish and replenish skin while fighting premature ageing. Infused with Macadamia Seed and Passionfruit Seed Oils, this face cream can be enjoyed by men and women, as it provides skin with vital nutrients and vitamins that help to delay skin and cell ageing, assisting to reduce fine lines while restoring, brightening and hydrating skin. Hunter Lab’s hand and body range are the perfect accessories for a modern bathroom. Available in a beautifully packaged skincare set, and individually, the Hunter Lab Hand & Body Wash and Hand & Body Lotion are high-quality, natural, vegan formulas. Ideal for both men and women, this Australian made skincare brand is the perfect way to treat yourself or spoil a loved one. Please note, Hunter Lab is available for shipping with Australia only. Buy now and pay later with After Pay. Showing 17 products of 17. I have a bob and I love putting this product in the ends. It gives lovely separation and texture to my hair. The pomade isn't too sticky and it smells lovely and fresh. Would definitely recommend to all the girls out there looking for texture! I researched a good cleanser that would not be a nuisance when I was going overseas. This has not disappointed. Great product. A solid roll on cleanser that you massage in, rinse off. No mess and my skin is looking great in a cold climate after 2 weeks of daily use.